We are delighted to welcome Tom Bullock as our guest speaker for our January meeting. Tom will give us a presentation on "Soft Hackled Flies and How to Fish Them". 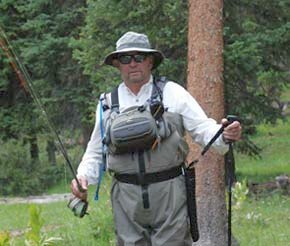 Tom has fly fished his entire life and travels extensively in pursuit of trout with wet flies. He’s also a board member of the North Louisiana Fly Fishers, and the IFFF Gulf Coast Council. Also on the agenda: fishing reports, upcoming regional events, and ideas for a local fishing outing. This month's pattern will be the Jitterbee. This now-famous bream fly was created by Randy Leonpacher of Baton Rouge two decades ago. Randy, an avid bream fisherman, was looking for a fly that could best match the tiny split-tail plastic grubs he had success with on spinning tackle. Unable to find such a fly, he created his own - and the Jitterbee was born! 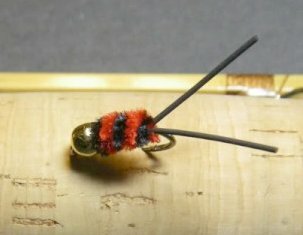 The Jitterbee is an excellent bead head nymph that looks like a bee with a cricket-like tail. Best colors are black/orange, black/red or black/chartreuse. As Randy says, "This bug is my first line of offense for bream. It can be fished deep or under a strike indicator. In either case don't set your rod down 'cause once the bream get sight of this bug its gone pecan!". Instructions for tying the Jitterbee can be found on www.laflyfish.com and on www.frankenfly.com. The photo shown comes courtesy of FrankenFly. We regretfully have announced that our first-ever general fishing expo which was set for January 21st has been cancelled. If we had postponed the event, we had enough vendor interest for a later date, but there were very few dates available and all had considerable conflicts. The club is still looking forward to doing a special event each year. What that event might be is in discussion. We may go back to doing our very successful - but much smaller - fly fishing festival. Or we may hold a fishing event, similiar to the New Orleans Fly Fishers Rio Grande Rodeo.